The HydroScat-2, HydroScat-2 Abyss, HydroScat-4 and HydroScat-6 are literally and figuratively the First Family of multi-wavelength optical backscattering sensors: not only the first in the world, but also preeminent in performance. The most economical HydroScat. Measure backscattering at 2 wavelength, plus fluorescence. HydroScat-2 performance at 4 km depth. Measure backscattering at 2 wavelengths, plus fluorescence. Measure backscattering, or a combination of backscattering and fluorescence, at 4 wavelengths. 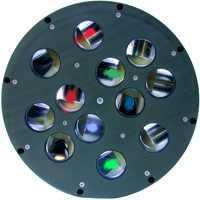 Measure 8 quantities: backscattering at 6 wavelengths, plus 2 fluorescence.